For a decade, NASA's Chandra X-ray Observatory has observed the Andromeda Galaxy for a combined total of nearly one million seconds, giving astronomers an unprecedented view of the nearest supermassive black hole outside the Milky Way. Astronomers think that most galaxies – including the Milky Way – contain giant black holes at their cores that are millions of times more massive than the Sun. At a distance of just under 3 million light years from Earth, Andromeda -also known as M31- provides an opportunity to study its black hole in extraordinary detail. The supermassive black hole in Andromeda, like Sag *A, the Milky Way's supermassive black hole is ten to one hundred thousand times fainter in X-ray light that astronomers might expect given the reservoir of gas around it. However, on January 6, 2006, the black hole became more than a hundred times brighter, suggesting an outburst of X-rays. This was the first time such an event had been seen from a supermassive black hole in the nearby, local universe. "The black holes in both Andromeda and the Milky Way are incredibly feeble," said Zhiyuan Li of the Harvard-Smithsonian Center for Astrophysics (CfA) in Cambridge, Mass. "These two 'anti-quasars' provide special laboratories for us to study some of the dimmest type of accretion even seen onto a supermassive black hole." After the outburst, M31* entered another relatively dim state, but was almost ten times brighter on average than before 2006. The outburst suggests a relatively high rate of matter falling onto M31* followed by a smaller, but still significant rate. "We have some ideas about what's happening right around the black hole in Andromeda, but the truth is we still don't really know the details," said Christine Jones, also of the CfA. The overall brightening since 2006 could be caused by M31* capturing winds from an orbiting star, or by a gas cloud that spiraled into the black hole. The increase in the rate of material falling towards the black hole is thought to drive an X-ray brightening of a relativistic jet. The cause of the outburst in 2006 is even less clear, but it could be due to a sudden release of energy, such as magnetic fields in a disk around the black hole that suddenly connect and become more powerful. "It's important to figure out what's going on here because the accretion of matter onto these black holes is one of the most fundamental processes governing the evolution of galaxies," said Li, who presented these results at the 216th meeting of the American Astronomical Society meeting in Miami, FL. These results imply that the feeble, but erratic behavior of the black hole in the Milky Way may be typical of supermassive black holes at this stage of each galaxy's evolution. In 1987, John Kormendy of the Dominion Astrophysical Observatory, National Research Council of Canada (NRC) found evidence that the Andromeda Galaxy contains a central black hole ten million times as massive as the Sun. 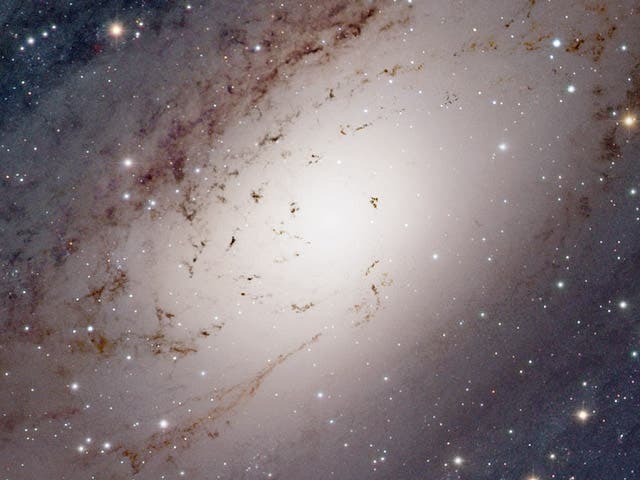 Like our Milky Way, the Andromeda Galaxy or M31 is a swirling mass of several billion stars. At a distance of 2 million light-years, it is one of our nearest neighboring galaxies. Astronomers believe that supermassive monster black holes are feeding on unwary stars and gas that pass too close to the centre. But clearcut evidence for monsters had not been found. The black-hole searches are carried out by looking for large amounts of mass that cannot easily be explained by stars. Measurements are made of how rapidly a galaxy rotates. If there is a large mass at the centre, then stars have to move very quickly when they come close to it. Kormendy explains that "the velocities are so large near the centre of M31 that there must be three or four times as much mass hiding there as we see in stars. Ten million solar masses of matter are crowded into a volume less than 5 light-years in diameter. This diameter is about the same as the distance from the Sun to the next nearest star. A black hole is the most likely explanation." Supermassive black holes are remnants of the evolution of clusters of stars. They form with masses of thousands or millions of Suns. They continue to grow whenever anything passes too close. This suggests how the engines powering activity in galaxy nuclei may work. "We think that gas continually falls into the black hole. Eventually it forms a superheated disk that rotates around the hole at almost the speed of light, radiating ferociously and burping out the jets that we see. The activity in galactic nuclei is really quite remarkable. Volumes as small as the Solar System can emit a trillion times as much energy as the Sun. But despite its large central mass, the Andromeda Galaxy has one of the least active nuclei known. Ironically, the best case discovered so far may be a monster that is starving.